Almost two months ago, a couple of us went on a trip to Los Angeles to join the Global Homeboy Network Conference, and meet with different organizations and people working in LA to serve the poor and destitute. This trip was significant for me, and I have been wrestling with how to share some of the lessons learned there. Many people have asked how the trip was, and some of you made it possible for us to go. I want you to know the trip was fruitful, well timed, and worth your support. However, I kept ending up with a blog post that was far too long. So instead of one blog to share lessons learned in LA, I will be breaking them up into several blogs, each with a different thought to convey. When we first got to Los Angeles, I was wide-eyed. I don’t travel often, and I’ve certainly never been west, so I wanted to soak in as much of it as I could. LA is large, busy, diverse, and seems to go on forever, bleeding into surrounding cities. Unsurprisingly, it was such a contrast to Tampa. Although the two cities are similar in at least one way: we have the highest amount of houseless people per capita in the nation. 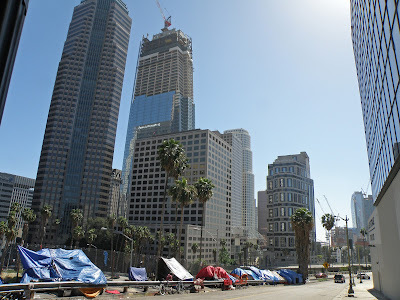 Los Angeles has over 40,000 people living in transient housing or on the street. The first contrast to Tampa I noticed were the tents in crevices of the walls along sidewalks, the mattresses hidden behind bushes along the highway, the makeshift homes of people with no roof to call theirs. This might sound strange, but my heart swelled at the sight. It is sad, and wrong that people must live this way. But I was encouraged to see that some people were still allowed to exist and be seen even though they must live on the street. In Tampa, we sweep people on the street under the rug like they are dirt. We don’t even want to see them in the gutter. Tampa hates seeing poverty. In LA, people without material provision were visible. They were allowed to set up camp, whereas here, people with no place left to go (because Tampa has a shocking lack of shelters and resources) who set up camp outside of the Well (because we were the one place that wouldn’t shoo them away) had pictures taken of them and complaints were sent to code enforcement. All of the sudden we also were a place someone with no home was not safe to simply scrape by an existence. Homelessness in LA is a symptom of a sickness in the heart of that city, a sickness Tampa shares. But in Tampa we hide the symptoms of our culture of self-focusedness, exclusive community, money-idolization, fear of the “other”, obsession with security, consumerism, and personal property rights over human need. The symptom of our sickness is the people on the margins living in poverty, with no shelter, in the midst of daily violence, trauma, fear, uncertainty, with basic needs unmet and death always around the corner. We isolate poor people to poor neighborhoods that we drive around on our highways, we ticket people sleeping on benches because they have no bed anywhere else, we spend money on bussing people out of our city instead of finding out how to use that money to care for our people (please visit Tampa! We’re a paradise! Except if you’re poor, then we’ll pay you to leave! ), and we find excuses to arrest the houseless to hide them from our eyes; we hate seeing the results of our sickness, and this is how we numb ourselves to the cracks in our society. In LA, I was thankful that the symptom was there for all to see, and you could not be numb to it. I don’t know how people are treated in LA, from stories I heard and the locals I observed, I imagine not well. But at least you either had to show the hate in your heart by calling the police on a shabbily dressed man limping towards the donut shop door (which I overheard someone consider doing) or show compassion to the person on the street. As Dorothy Day said, “we must talk about poverty because people lose sight of it.” It is so easy to lose sight of poverty in Tampa, and that is why we at The Well must continue to not allow ourselves to become numb to poverty’s realities in our city, or even our world, and we must continue to break through the numbness and apathy of our city. The entire trip to LA helped remind me what is important. For the past couple months, I have been tired. Some would say depleted, some would say burnt out. Getting away, seeing a new place with it’s own beauties and issues reminded me of all the beauty and pain in my city. I was able to rest, take several deep breaths of dry Californian air, and take some space to remember what I truly value. I hope in the next several posts to share some of that refreshment and inspiration with you as I share more details about what we encountered on our trip. This is an outstanding venue, with great and thoughtful staff, and a fantastic chef. The location of seattle venues is well situated. We has been delighted to host our annual event at this location for the past few years, and the space has been perfect for our group of roughly 300.